For a good stretch of his career, the word “genius” trailed Robin Williams, and not always to his benefit. In the introduction to a long 1988 interview with Williams in Rolling Stone, Bill Zehme wrote that the then-new Barry Levinson film Good Morning, Vietnam was “being hailed as the first big-screen project properly suited to the comedian’s genius.” In one sense, those doing the hailing were correct. Inspired by the war experiences of DJ Adrian Cronauer, the film’s on-air segments allowed Williams to drop the inspired, improvised routines that first made him famous as a stand-up into the middle of a dramatic story. It wasn’t the first time Williams had proven himself as a dramatic actor. The Juilliard-trained Williams’ dramatic abilities had been evident since The World According To Garp. Nor was it the first time he’d been able to draw on his improv skills, which had been the backbone of his star-making turn on Mork & Mindy. Yet there’s another side to that acclaim, a suggestion that Williams’ skills made him a freak, burdened with a talent that rendered him unsuitable for most roles. What made him a genius in nightclubs made him unconvincing as an ordinary person—or made it seem that when he did play an ordinary person, he was wasting his gifts. Williams’ best work as an actor suggested another option, synthesizing his faster-than-thought comedic gifts with soulful character work. It would be most evident in the years after Good Morning, Vietnam made him a bankable star, one whose successful films gave him the freedom to pick and choose his projects. He often chose well. Like Good Morning, Vietnam, his next big hit, Peter Weir’s Dead Poets Society, found room for comedic asides alongside the drama. But Williams was just as good in the Penny Marshall-directed Awakenings, which forced him to bottle up his free-associative tendencies, and especially in Terry Gilliam’s The Fisher King, in which he plays a man for whom flight into fantasy serves as both an escape and a trap. Williams’ filmography is littered with the forgettable (The Big Wedding) and the regrettable (Old Dogs). He had a habit of using his skills as a crutch, as in a painful improv sequence in the 2006 comedy RV that found him busting out a decades-out-of-date b-boy impression, or relying on a wistful man-child twinkle (e.g. Hook). But it’s impossible to imagine anyone else playing Williams’ best roles, and The Fisher King easily ranks among them. I’m not sure that’s why it was the first Williams movie I thought of after hearing about his death, however. It’s often unwise and irrelevant to connect actors to the roles they play, and yet something about Williams’ suicide has invited it. He often played men struggling with darkness, sometimes without success, frequently men who used verbal agility and unbridled energy as weapons in the fight. 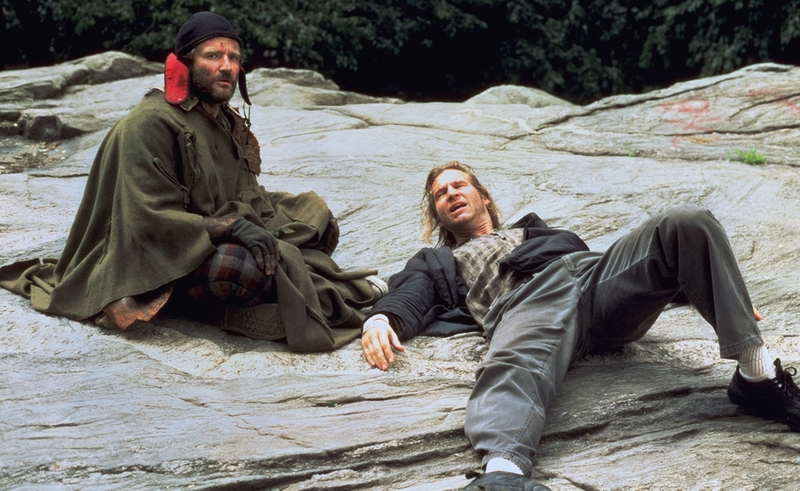 Few movies put that struggle to the fore as prominently as The Fisher King. Williams plays Parry, a homeless man who happens upon Jack Lucas (Jeff Bridges), a disgraced morning shock-jock bottoming out in the streets of New York, as a pair of thugs prepare to burn him alive. Though already on the verge of suicide, having tied weights his ankles and preparing to jump in the water, Jack welcomes the rescue and soon finds himself drawn into Parry’s rich fantasy world. Fashioning himself a modern knight, and receiving instruction from invisible little people, Parry is on a quest to retrieve the Holy Grail, which, having spotted it in an architectural magazine while following the little people’s instructions, he knows to be located in the library of a Manhattan mansion. What did end up on screen is very much a movie- and metaphor-friendly depiction of mental illness that, had it veered off course, would have risked romanticizing both instability and homelessness. As it’s handled, however, it works: Growing calmer and more coherent as the story progresses, Parry almost slips back into sanity near the end. But sanity also means remembering losing his wife when a gunman, inspired by something Jack told him on the air, shot up a bar three years earlier. It’s tough to watch this moment now, to see Williams play a man wishing for death, even though it’s consistent with the character Williams creates in the film. After a horrific experience, Parry has reassembled the world out of the shattered pieces of what’s been left to him—scraps left on the street, rags others discarded, medieval stories he taught as a professor, and memories of a time when a woman loved him. It’s kept him safe, but rejoining the world means confronting that loss, and finding happiness means understanding he could lose it all again. The figure of the Fisher King makes an appearance in T.S. 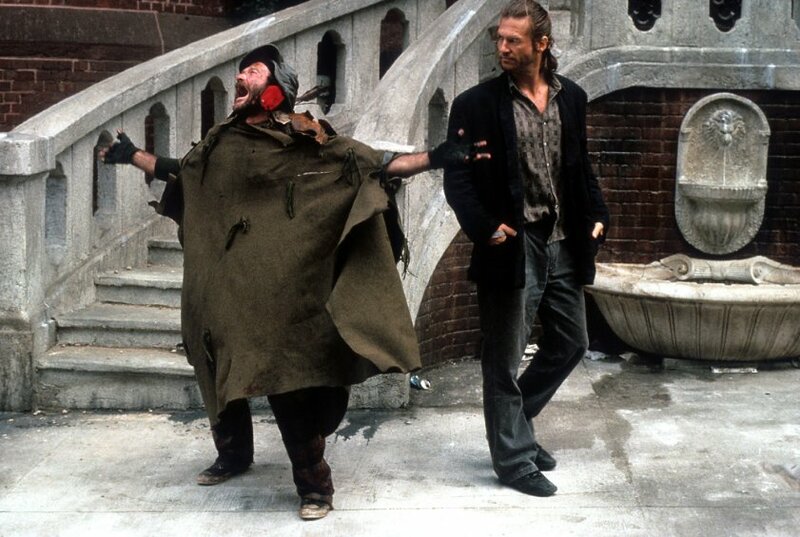 Eliot’s “The Waste Land,” but The Fisher King brings to mind lines from another Eliot poem: “human kind / cannot bear very much reality.” Gilliam’s previous films had made that a central theme, sometimes at a bit of a remove. Williams’ performance gives it flesh-and-blood form. Parry has the madness Williams brought to his comedy and the gravity of his best dramatic work, but nothing separates them. Williams the improv artist surfaces in lines like “Now that you know where we are, don’t be a stranger. Come back—we’ll rummage!” before vanishing as the character sinks down into muttered nonsense and conversations with unseen forces. The performance jumbles insanity, melancholy, and fragility together until they become nearly indiscernible. Parry finds the happy ending Williams couldn’t; it’s best to leave any other parallels there. Whatever resemblance Williams’ off-screen life bore to the characters he played, the work remains knowable in a way the man never will be, no matter how candid he was about his struggles in interviews. In his best roles, Williams conveyed a sense of despair and a need for connection, sometimes joining it to his comedic talents, other times muting that ability, but in his strongest performances finding a way to join the two, even if it was just to let a glimmer of his dervish energy peek out from behind his eyes. Williams’ best work, the stuff that will be remembered much longer than, say, The Big Wedding, didn’t clear room to accommodate his comedic skills. It allowed him to reinvent himself, to pound his gift into new forms to suit the screen. There’s genius in that, too.